Most people are unfamiliar with the different types of skin cancer. We may confuse basal, squamous, and melanoma thinking of them as variations of the same disease — but they’re not. In dermatology, we’re constantly asked questions like, “Will this basal cell turn into melanoma?” As far as skin cancers go, basal cell carcinoma and melanoma are polar opposites. Whether you’re dealing with a recent skin cancer diagnosis for yourself or someone close to you, or you’re just looking to learn what you can to prevent it, it’s important to know the difference. Skin cancers are not one and the same — here’s what you need to know about basal cell carcinoma. Basal cell carcinoma is by far the most common cancer in the world. With more than four million people in the United States diagnosed with basal cell carcinoma each year, this cancer affects more people than all other cancers combined. Fortunately, it’s also the least serious of all cancers. 99% of basal cell carcinoma cases stay local — meaning it only affects the area where it starts. Sure, sometimes it’s more complicated — they can invade structures locally near the eyes, nose, or ears, but true metastasis from basal cell carcinoma is extraordinarily rare. Other cancers quickly learn to metastasize and spread through the body, but basal cell carcinoma usually does not spread. Like most skin cancers, basal cell carcinoma is primarily found in fair-skinned individuals. It’s directly related to sun exposure. Cumulative lifetime sun exposure puts you in direct danger of basal cell carcinoma, particularly if you have spent a lot of time in high altitude conditions. This type of high UV exposure and the UV exposure from tanning beds dramatically increase your likelihood for basal cell carcinoma. There’s also a strong genetic component to this form of cancer. If one family member has basal cell carcinoma, chances are that someone else in the family will have it too. Please include attribution to https://www.epiphanydermatology.com/ with this graphic. Basal cell carcinoma goes largely undetected. For a long time, these places have a clear, pearly hue. It’s usually undetected until it finally gets to a size where the patient notices a new bump or until it starts bleeding. The telltale sign of a basal cell carcinoma is bleeding without a good reason. If you have a bump that starts bleeding without explanation, get it checked out. Basal cell skin cancer, like many cancers, recruit blood vessels to help it grow — and these blood vessels lead to bleeding episodes. The clearest sign of basal cell carcinoma is having a chronically non-healing spot. What Should I Do If I Suspect I Have Basal Cell Carcinoma? If you have a spot that’s not healing or otherwise looks suspicious, get it checked out by a dermatologist. Most dermatologists can identify basal cell carcinoma very quickly due to their specialized training in skin cancers. Over 90% of basal cell carcinomas can be identified on physical exams alone. If we visually identify a basal cell spot, we perform a skin biopsy. Skin biopsies are relatively simple procedures that only require local anesthesia. We take a sample of the bump and submit it for review to a pathologist. Under the microscope, basal cell carcinoma is very clear. With this process, dermatologists are able to diagnose basal cell carcinoma with a high sense of confidence — they’re not often mistaken. What Steps Can I Take for Basal Cell Carcinoma Prevention? Basal cell carcinoma prevention always starts with sun protection. By the time you get your first basal, you’ve probably already had a lot of sun damage. Once you’ve been diagnosed, play it smart so you don’t make the damage worse. Start making adjustments to your sun habits. Don’t go to the lake and sit in the sun all day. Don’t go to the golf course without a hat. It’s time to wear the right gear: hats, long sleeves, and sunglasses. Apply sunscreen to the areas still exposed to the sun. 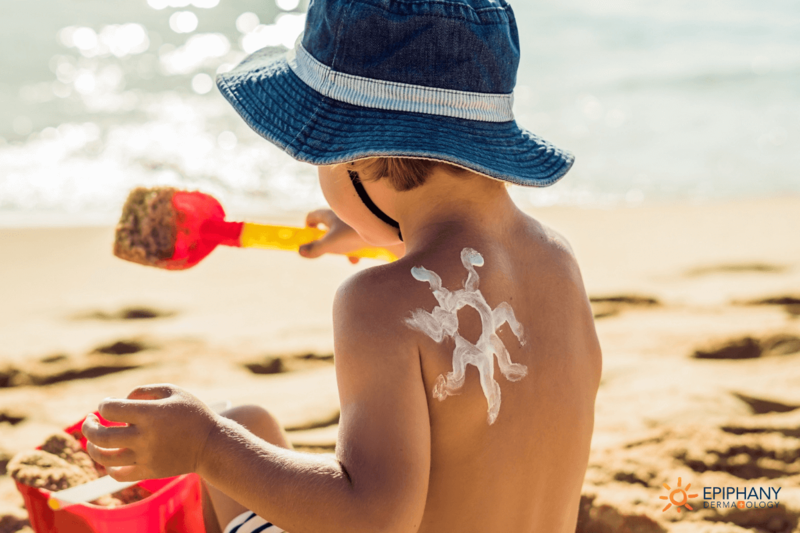 If you’re a parent, start instilling good sun protection practices at an early age to prevent skin cancer from the start. Just like parents should be teaching their children to brush their teeth morning and night to prevent cavities, parents should also be pointing out ways to protect our skin from sun damage to prevent skin cancer. Teach kids to wear their hats and apply their sunscreen for any extended time outdoors. What Is the Best Treatment for Basal Cell Carcinoma? Considering these factors, a dermatologist will guide you towards the basal cell carcinoma treatment option that will be most effective for your particular cancer. A dermatologist’s first preference is usually scraping the basal cell off the skin with a curette and treating the base with an energy (like an electric needle) or a chemical. This treatment is extremely effective. When performed three times, it cures at least 90% of small basal cell carcinoma. It’s fast, effective, and leaves minimal scarring. If the spot is in a cosmetically sensitive area like the face or neck, or if the margins of the tumor are clinically unclear, dermatologists often prefer an excision. Excisions can be done with a standard margin (3-4 mm). For an excision on a narrow-margin tumor, dermatologists commonly use a technique called Mohs surgery. In Mohs surgery, we use local anesthesia, then scrape the base of the tumor. We take a margin of 1-2 mm around the diagnosed basal area and process it in frozen horizontal sections. In about 15 minutes, we can determine if the surrounding margins are positive or negative. If any positive margins remain, we can repeat the process to clear the basal cell carcinoma. With Mohs surgery, we usually get a same-day closure and patients are highly satisfied with the cosmetic outcome. Some subtypes of basal cell carcinoma are best to treat with a cream. When lesions are isolated to small, superficial spots on the trunk or extremities, we can treat them with a topical agent over an extended period of time (usually 4-6 weeks). In patients who are poor surgical candidates or have a basal cell on the head or neck, we sometimes opt for radiotherapy. Radiotherapy is highly effective because basal cell carcinoma is extremely radiosensitive. With a course of three to six weeks of radiotherapy, over 90% of basal cells can be treated successfully. For very complicated cases and poor-surgical candidates, we have two oral treatment options for basal cell carcinoma. Hedgehog inhibitors can block growth pathways of basal cell carcinoma and put the cancer into remission. If you have a spot that won’t heal, or any spot that seems suspicious, don’t wait to call your dermatologist. The earlier a spot is diagnosed, the easier it is to treat and the better your chances are for a full recovery. Give us a call to schedule your appointment so we can see what you’re dealing with and get you started on the right treatment right away. Dr. Adrian Guevara is a board-certified dermatologist in El Paso, TX. 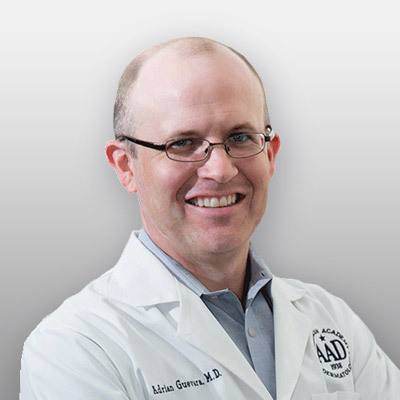 As a Fellow of the American Academy of Dermatology and the American Society for Mohs Surgery, Dr. Guevara has served the extended El Paso and Las Cruces region since 2006. In his spare time, Dr. Guevara enjoys spending time with his family and playing tennis. Learn more about Dr. Guevara.